As travel bloggers, Zombie and I try to cover as much variety in this wonderful planet of ours. But the ocean and tropical weather keep calling out to us. So wherever there’s promise of sun and amazing marine life, we are sure to be there. As we travel to different beach and island locations all over the globe, I’ve become the girl who loves bikinis more than shoes. I used to succumb to bikinis even during winter! But my ‘bikini IQ’ has developed significantly as I swam and dove with a lot of them. Bikinis that look wonderful on land, but almost disintegrates once underwater. They fit well on surface, and start to fall out of you when you’re underwater. Ones that look amazing on land and underwater, but the moment you surface, you look and feel like a fish out of water. Those that were truly amazing and wonderful, both in and out of the water– for one time use. So for our 2-week Maldives trip, I took with me a handful of JETS swimwear. JETS has a design philosophy of creating swimwear with absolute precision in their cuts whilst creating silhouettes that look elegant both in and out of the water. Because of the basic cut of this bikini – full top and bottom coverage, I wore this when we went swimming with whale sharks. We had to do quick dives from the boat once a shark has been spotted. And normally, after I dive in the water, I would check if any bits and pieces of myself are still safely tucked. love that this bikini matches the blue hues of the Indian Ocean! One thing to take note of – due to the style of the bikini’s shoulder straps (close to the edge), I had to make sure that the straps were really snug and adjusted a little tightly, as it may tend to fall off your shoulder. What I love about it: The flexible, moulded cups, and the classic cut of the bikini. This is perfect for those who want to don a bikini without wanting to be too ‘daring’. I confess that I was abit scared to wear the bottom of this bikini. Previous experience has taught me that bikini bottoms that tie to the sides are a recipe for going instant commando once you dive. But what do you know? This bikini turned out to be my favourite among the bunch! wake me up only when cocktails are ready. I love the interesting mix of print in this bikini in a white base. I can imagine the bikini top being worn in festivals with a long sleeved chambray. This can also be worn without straps, perfect for those wanting an even tan. 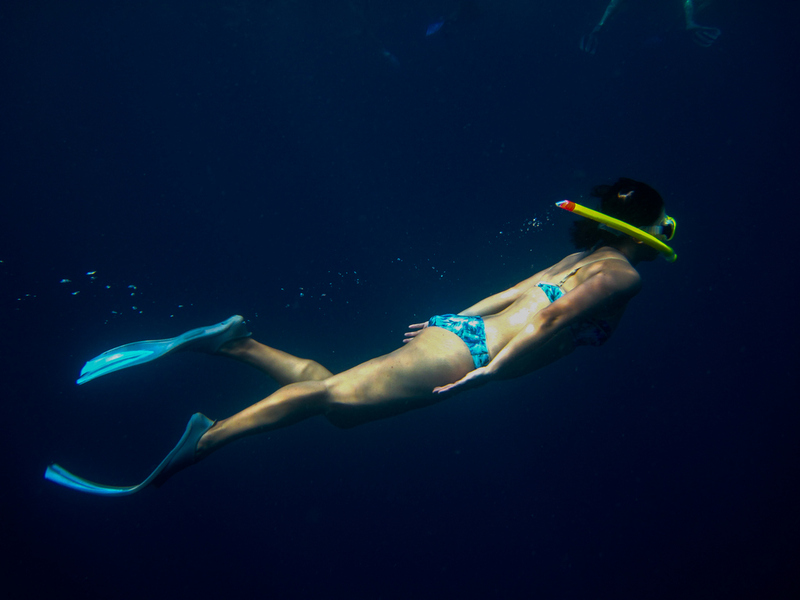 The colours of the bikini make it very photogenic underwater as it stands out against all the blues and greens. Yep, I think it’s safe to say that this bikini is perfect for adventures in and out of the water! I do love one-pieces (or maillots) but most of them are such a pain to get into. The maze of criss-crossing straps, the confusion of loops- by the time I figure out if that loop was meant for the head or an arm, I’m beyond exhausted , give up, and wear a bikini. But this! Not only has this been THE most amazing one-piece I’ve ever worn, it’s also the easiest and simplest to wear. The strapping method is very clever and neat. I’m in and out of the piece in less than a minute. 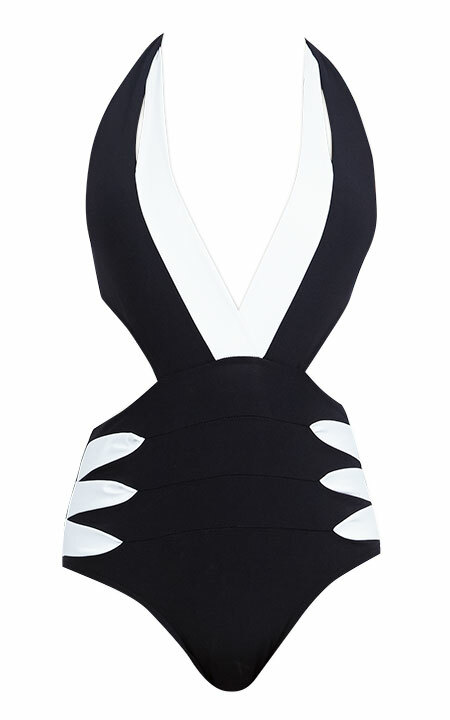 Locations such as the Maldives require special resort-wear, and this one-piece is a match to every luxury resort. I’m normally not one to choose flowery prints but I am drawn to how the print is not too focused on flowers but more on unusual detailing like the leaves and stems. And the colour! Very faint mint green – this is a very feminine bikini print and style. The halter straps are perfect too for those needing extra lift and support. The bikini bottom also has extra coverage above the hips with a thick mesh lining. I spent quite a lot of time underwater in this bikini and it never budged nor felt uncomfortable underwater. The mesh parts were so soft I didn’t feel them at all. The style perfectly matched the resort where I wore this too, Kurumba, where lots of greeneries and trees abound. I will certainly take JETS swimwear travelling once more. They did pass the test and claim of maintaining style both in and out of water, and the fact that all their cups are flexible and in-seam are very important for me – I need as much space in my luggage as I could get! All the bikini bottoms have great elasticity that holds up very well even when doing rigorous activities. The quality can also be seen in how they held up post use and post wash – after handwashing them and putting them out to dry in the sun, they still looked and felt brand new. None of that bacon crispiness that cheaper bikinis have after being out in the sun. I also have to say that their designs are really what I look for in swimwear – stylish but not provocative, and classic lines that are not boring. Their new collection just came out and I’m finding it hard to concentrate. It is always summer somewhere, isn’t it? What do you look for in a swimwear?